I was asked by Jane from The Heritage Cook if I would like to make a recipe from the new, revised and expanded edition of her cookbook, The Gluten-Free Instant Pot Cookbook, also written by Sara De Leeuw, who I don't yet know. Yes! I love when I get to make things for others. I love Jane's blog and it's so nice that she posts delicious gluten free things. (Thank you for asking me to be part of the revised book promotions, since it was so easy to say yes and I'm flattered you thought of me!) I'm excited to have the opportunity to finally meet her this coming August when Kevin and I go on a trip to San Francisco where she lives! 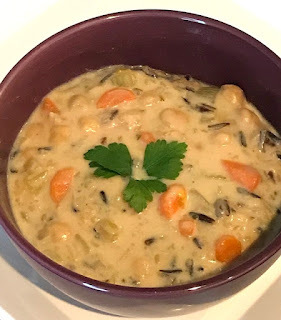 I'm all about sweet treats, but when I get to choose something savory that I'd like AND when it's vegan and one of my sons is currently vegan, I didn't have trouble deciding to make this soup. I'm still finding unconditional love for the Instant Pot, but rice has become one of my favorite things to make in it. Add some veggies and healthy protein like chickpeas (garbanzo beans) and I'm all for it. The soup was great with just veggie broth, but with the option to add some cream made from cashews, it was even more a hearty, filling delight. I dare anyone who thinks they wouldn't like it because it's vegan and doesn't have real cream, to try it and see for yourself. You'd never know! Parker liked it! He had a bowlful then when I was cleaning up he decided he wanted another bowlful. 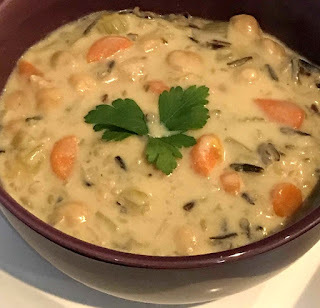 This soup is very much a win in the gluten free category AND for vegans--and for anyone because I guarantee if you don't tell them, they won't even realize it. Some people tend to shy away from gluten free recipes, but I've found with this book that a lot of the recipes are naturally gluten free anyway and are just like what you'd make regardless, such as this soup or pot roast, chicken wings and deviled eggs just to name a few others. But a lot of the other recipes, like Creamy Steel-Cut Oatmeal with Apple Raisin Compote, which I've also made before, is delicious. There are so many more, too! I may just start with the first recipe and make my way through each one. Come to think of it--I haven't eaten dinner yet and I'm hungry. Soup is calling my name! Press Sauté on the electric pressure cooker. Add the oil to the inner pot and when it is hot, add the onions. Stirring frequently, cook the onions until softened and translucent, about 4 minutes. Add the garlic and continue stirring. Cook for another 30 seconds, until fragrant. Stir in the carrots and celery. Cook them, stirring frequently until the vegetables are softened, about 4 minutes. Add the drained chickpeas, wild rice, bay leaf, thyme, and vegetable stock. Stir well. Close and lock the lid, making sure the steam release handle is in the sealing position. Cook on high pressure for 25 minutes. While the soup is cooking, make the cashew cream. Blend the soaked and drained cashews with the ½ cup fresh water in a blender until completely smooth. Set aside. When the soup is finished, release the pressure naturally. Turn the steam release handle to venting, releasing any remaining pressure. When the float drops, unlock the lid and open it carefully. Stir in the cashew cream (if using) until completely incorporated. Add salt and pepper to taste. Serve immediately. 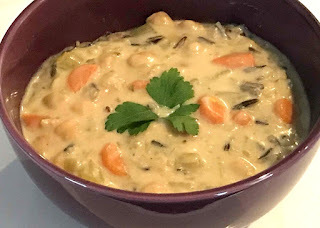 The soup was pretty simple to make and I'm enjoying the Instant Pot more every time I use it. If you don't have one, get this book and an electric pressure cooker and enjoy time-saving meals (and desserts)! Did I mention there are desserts, too? Thanks so much for helping us out Katrina - we are thrilled that you and your son enjoyed the soup! Thank you for your kind words about the book, we are proud of it and hope it helps others to utilize their pressure cookers to make delicious meals!